While it might seem to some, myself included, that I’ve embarked upon my dotage, I do try to remain current in the music realm. Thus I eagerly await the Beatles reunion tour and wonder what Beethoven’s got cooking. But I jest. So here we are at the ¾ mark for the year and I’ve discovered a bucket full of outstanding albums put out this year. So many, in fact, that this will have to be a two-parter (Will Buck survive Ming’s deathray and carnivorous weasels?) … Well, maybe not a cliffhanger per se. 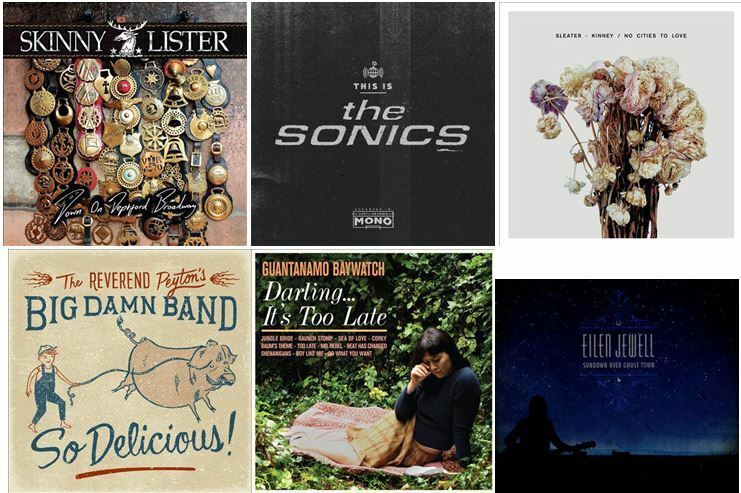 So, in no particular order, here are some of my favorite albums of 2015 thus far! Skinny Lister’s music features ethereal Celtic folk melodies melding gracefully with rollicking rock and roll. As a reference point think of Dexy’s Midnight Runners at their best, and then think a bit better. These lads and lass, based out of London, have had a fair amount of success since their inception in 2009, and one listen to this album will show you why. 3 stars. Out of 3. This album I’ve already blogged about extensively, so simply buy it, memorize my earlier post and pick your jaw up off the floor. Best album of the year. 3 stars. Out of 3. Filed under Local Music, these riot grrrls are still putting out an aural assault worthy of a jumbo jet liftoff. Oh, and they write great songs too. Question: What happens when a local punk/indie/riot grrrl band plays together for nearly 20 years? Answer: This album. If you like it edgy and fast, then giddy up and go. 2.5 stars. Out of 3. Perhaps my most surprising find of the year, this demon in the rough features a bluesy old-timey group that delivers fun and frivolity and furniture. Without the furniture. Imagine a pig caller shouting the blues while his band of hobgoblins lays down swamp boogaloo pulled from the very depths of hell. If you can imagine this you might want to seek therapy as soon as possible. But Reverend Peyton does bring music from the land of smoky kudzu-infested nights filled with passion, disappointment and whiskey. Check it out and expect to be mesmerized. 3 stars. Out of 3. It’s very seldom that I find music I’ve never even heard of and get blown away. Enter Guantanamo Baywatch. Granted, my attraction to this album was the band’s name (hey, I’m a superficial guy), but without knowing the genre or anything about the lads and lasses, I discovered a new favorite. And this is one of the beauties of the library, looking into unknown works at no cost to yourself. Expect surf mixed with 50s/60s fun pop/rock. 2.5 stars. Out of 3. One of the greatest voices currently putting out music,her gorgeous country music takes you to wide open spaces where the sun sets over hot-baked dirt, followed by crazy nights in crowded honky tonks. 3 stars. Out of 3. Tune in for more 2015 albums in the near future. And keep your dune buggy off of my lawn, young whippersnapper! This entry was posted in Music and tagged best of 2015, local music, Music, new music by Ron. Bookmark the permalink.